Five years. It took five years for the original issues that this omnibus collection contains to come out. And it was worth every day of those five years. Eric Shanower is doing a phenomenal work in creating this narrative of the Trojan War. His research is exhaustive and it shows in every line of art he draws, whether it is a designs on pottery or a tapestry, the clothing and armor of the characters or the consistent facial characterizations from issue to issue. Sure it might be a challenge to maintain interest in a graphic novel like this for five years, but the reward is unquestionably worth the wait. This is a beautiful work of art and clearly a labor of love. And something I do dearly love giving one of my highest Rickommendations to. If you haven't yet read Shanower's Age of Bronze, you should. Even it takes another five years for the next volume to come out, I'll be waiting - eagerly. The slowest yet but even then it's still a solid 4 stars. But now that publication of single issues has slowed to a crawl, and the statement that there will be an entire third volume of "Betrayal", makes me seriously wonder if Shanower will ever make it to the end. This book is started off with a message from Kassandra stating that Achilles has killed Kyknos. Pandarus allows a bond between his niece Cressida and Prince Troilus. Troilus splits a piece of cloth and asks that she keep half to remind her to be true to him, which she says she will do it. Troilus then splits a piece of cloth to symbolize his love and that she should hold onto it until they see eachother again but when Cressida is sleeping Pandarus kidnaps her and takes her to the enemy base and gets Troilus to fight back and try to recover her back to safety.Troilus meets Diomedes on the battlefield she discovers that Cressida has given Diomedes her piece of the cloth, he believes she was cheating on him. Another very powerful king named Agamemnon and he has to cross the sea but there is a lot of fighting involved just to cross the sea but he makes it across the sea. Other fights along with this one include the war between the powerful leader Achilles and his cousin against the strong fighting Hector. This war is getting one step closer to Achilles death.Everyone is preparing for this huge battle and when it happens Helen the only woman standing after this battle. She can barely watch as most the heroic fighters fall to the ground. The battle is very gruesome and Helen sometimes looks away until the battle finally ends.I would give this book four stars because there was just too much blood and fighting throughout the book and it got too boring. This is an incredibly impressive project. Each time I finish a volume of the series Age of Bronze, I’m amazed at the amount of research that must have gone into the creation of this epic retelling of the Trojan War. This is not only evident from the supplied bibliography in the back of each volume, but in Shanower’s marvelous artwork where each costume and piece of armor has the feel of authenticity. The story is a vast one and anyone familiar with Greek mythology or Homer’s Iliad or Odyssey will recognize many of the character names and story lines. Shanower does a great job of bringing these stories and people from ancient times to life. The complex events of the Trojan War involves a huge cast of characters and fortunately, to help us keep events and characters straight, Shanower gives the reader some help along the way. He not only begins each volume with a recap of previous events, but in the back of the book he provides a glossary of names (with pronunciations) where he briefly explains who the characters are and who they’re related to. As if that weren’t enough, he also provides genealogical charts of the two main family lines involved in the story. This particular volume is Part Two of the third volume which collectively is known as “Betrayal.” There are a lot of battle scenes in this volume and to keep the detailed battle drawings from becoming too confusing, Shanower helps the reader identify the various warriors by giving them distinctive armor. By looking at their helmets, I was usually able to identify which character was involved in a scene. But this volume isn’t all about battle, a good portion of this book also relates the love story between Trolius and Cressida, whom Shakespeare immortalized in one of his plays. My only disappointment with this volume was that it ended too soon, leaving me wanting more and I know it will be a long wait before the next volume becomes available. I highly recommend this series to anyone interested in historical fiction. Eric Shanower's graphic retelling of the Trojan War continues. In this volume, we get the Greek armies landing on the Trojan beach as well as the tragic tale of Troilus and Cressida. Shanower's art is amazing as always, with his finely rendered black-and-white drawings capturing everything from rough life in the camp to the hand-to-hand gore of Bronze Age warfare. His characters can be tough to distinguish in their armor, although Shanower does give us hints with ornate helmets to help us keep track of who's who.The story us a little too wrapped up in the action, however. Page after page of battle scenes capture the drudgery and brutality of this long war, but they end up conveying a bit too much of its repetition to the reader. I ended up wanting more variety in the telling.There's also not much advancement in the character arcs here. Achilles remains a glory-hungry psychopath, Hector noble, Paris vain. Young Troilus suffers the agonies of love from afar, but he doesn't really rise above one-note longing. Similarly, there's a lot of talk about hunger and discontent in the Greek camp, but the politics of the situation don't advance much, and the alliance never seems to really be at risk of fracture or mutiny.Still, it's a joy to watch Shanower capture these classic tales in his own style, and he humanizes the iconic characters by emphasizing their pettiness and cruelty. When Cressida is "rescued" by the Greek camp, the assault that welcomes her is shocking, making it near impossible to identify with any of the Greek kings as heroes. They're more like bandit-kings, waging war for their own reasons--or advancement. The resulting bloodshed, we're reminded, is an epic waste for nearly everyone else. It's been so long I didn't realize Shanower was still doing these. This is a retelling of the Trojan War, using not only Homer but countless other sources. Here we focus primarily on the story of Troilus and Cressida, for instance. Great looking, solid drama, but I don't like Shanower's scenes of the actual battles as much as everything else he does in this book. Otherwise it would get another star. It seems like forever since the last volume of this series was released, but Eric has been doing other things. This chapter of the retelling of the Trojan War focuses heavily on Troilus and Cressida, a Trojan prince and the daughter of an unpopular seer from Argos, respectively. Shakespeare wrote a play about the characters, focusing on Cressida's unfaithfulness to her lover, but I haven't read it. Cressida's father Kalchas, who defected from Troy to the Achaeans but isn't trusted by them either, is also a significant player; and the prophetic but never believed Cassandra makes a few appearances. As usual, the art is excellent, very detailed and full of attractive people and violent battle scenes. Eric generally does a good job at differentiating the characters, who can admittedly be somewhat difficult to keep track of at times. It's a fascinating look at an old story. This volume was devoted to the story of Troilus and Cressida. Hardly any development of any of the other characters or any other plotlines.As a result, for months to pass while the romance blossomed without touching on Achilles' resentment of Agamemnon's use of his name to lure Iphigenia to her death or any other interactions between the Greek kings, it just seemed like everything else was put on hold. Finally, the setup for the betrayal seemed incredibly contrived. Really, was there no other material available to be ripped up use as a bandage other than the gift from Troilus? Prosegue l'opera di cui, un grande intenditore, disse "se la guerra di Troia è davvero avvenuta, allora deve essere avvenuta come Shanower la narra! "L'unica pecca è che il ritmo delle pubblicazioni originali è davvero calato tantissimo.Ritengo che Shanower si sia posto una sfida veramente enorme; si sta rendendo conto che probabilmente non ce la farà a portarla avanti come desidera. Spero di sbagliarmi perchè questa serie-capolavoro è davvero la migliore apparsa negli USA degli ultimi 30 anni. A magnificently detailed telling of the Trojan War. Shanower's art is packed with historical specifics and his script is strong, focusing this volume (maybe a little too heavily, although with devastating effect) on the tragic romance of Troilus and Cressida. My only minor complaint is my lazy wish for Shanower to differentiate the characters more - all those Greek features are sometimes hard to tell apart! Age of Bronze is one of the best comics being published today. Check it out. The war has truly begun in this volume, but it zeroes in primarily on Troilus and Cressida and their tragic love affair -- Poor Cressida. She was in an impossible situation at every turn, and the choices she makes... it's clear how much grief it causes her at every step. 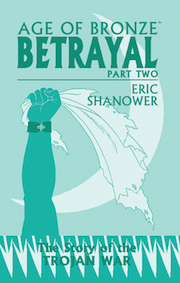 Fingers crossed Shanower forges ahead sooner rather than later with part 3 of Betrayal. The only thing wrong with this series is that it can't come out fast enough. Shanower's art and storytelling is meticulous and magnificent, and this latest entry in the series is up to the high standards he had previously set. This was very good, too. I thought there was maybe too much focus on one particular plot (subplot?) It's less interesting than most of the other stuff going on. But it's all so intense and global at the same time.Crushing that this appears to be the end of the story for now. Bit of a letdown compared to the 3 previous volumes. Another volume of the incredible Age of Bronze, and it's a shame that the series seems to be on hiatus.